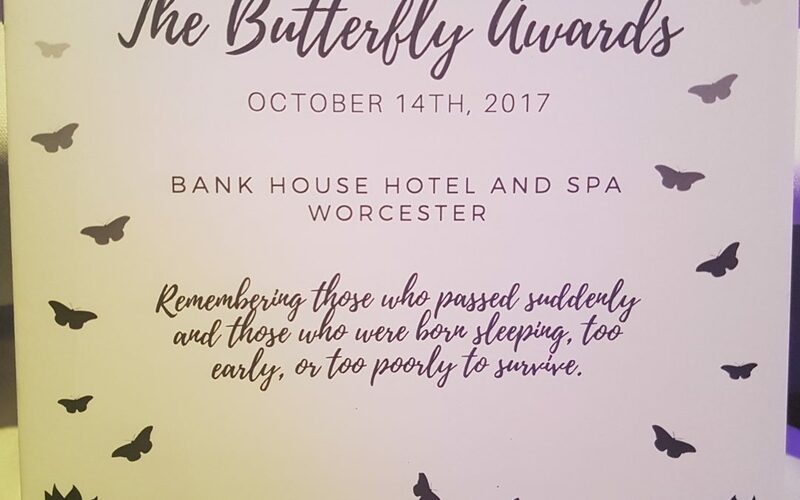 I spent Saturday evening at the Bath House Hotel in Worcester at an awards ceremony. 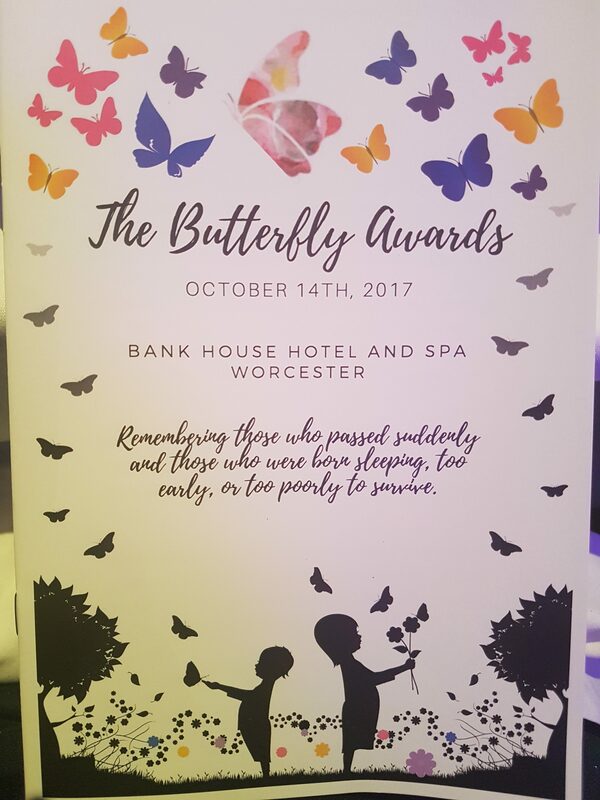 The Butterfly Awards. It seems strange to say that I was at a ceremony giving awards to people who work and campaign around baby loss. And yet, hearing about the work that these people do, wow!! Yes, they should be applauded and lauded. And my heart broke that they had to be doing it at all. I learned about a baby boy who fought for 11 months to live. He had Rett Syndrome. I remember giving respite support to friends who fostered a young girl with Rett Syndrome. Until I met Jacob’s parents, I had never heard, nor known, that boys could have it as well. I listened with awe at the sheer amount of work done by parents who had lost babies.The ones who make tiny gowns from donated wedding dresses, the bloggers, the campaigners, the midwives and doctors, the Members of Parliament. All of whom were touched by loss in some way. All working together to raise awareness and provide support for the families. It was a fabulous evening and I’m proud to have been a finalist in the HealthCare Professional catergory. Kirsty Nguyen was a worthy winner. A midwife campaigning for change after her own daughter died. I found myself becoming introspective after the evening. I began to remember the women who enquired after my services, then emailed to say that they had suffered miscarriages. Two women, over the years, have miscarried whilst I was on the phone to them. The women I knew of whose babies died, in utero or post birth. And of course Grace, beautiful, beautiful Grace. The baby who died 3.5 years ago and took piece of my heart with her. And then I began to wonder, because of the nature of the work that I’m doing. Where do the women of colour go when they lose their babies? Who do they talk to? Do they talk? I don’t remember talk of babies that died as I grew. I remember a cousin, not a baby, who died and the only words spoken out loud were that he was too good to be in this world. I remember hearing of a girl, that I knew from school, whose baby died – Sudden Infant Death Syndrome, or Cot Death as it was known at the time. That talk was also hushed up. And so I began to wonder. Loss is terrible, no matter who it is that has suffered it. I do hope that the families of colour, the black families, the asian families etc, also have safe spaces to go to talk, to rage, to cry, to be.